Grab an eyebrow pencil or Sharpie and create this Cat Face Do-It-Yourself Headform Creation in seconds. Here the customization suits sale of wireless Cat Ear Headphones with built in speakers to share the listening pleasure. Drawn on whiskers and a blackened nose add to the cat-like look. Consider other drawn-in-place elements for a different look … perhaps mime or clown face? 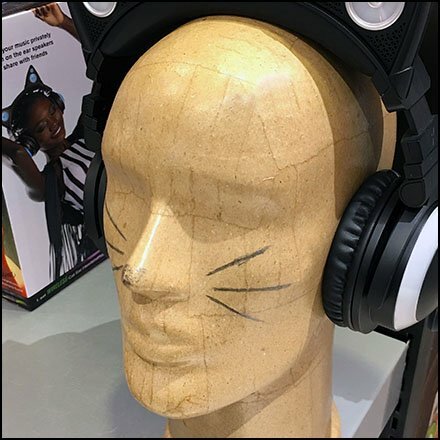 This Cat Face Do-It-Yourself Headform Creation seen at Brookstone, The Short Hills Mall, Chatham NJ.